conservation themes as Tom Chatterton and his young son, Bobby Blake, have turned their property into a wildlife preserve. Greedy cattleman LeRoy Mason, in an effort to acquire the property for his use, employs two henchmen to carry out his dirty deed of loosing a trained killer bear on cattle in the area to build up sentiment against the game preserve ideas. Adrian Booth, unlike any other Republic leading lady, got equal billing with Monte in every one of their seven westerns together. Republic even put the Sons of the Pioneers in to back up Monte in his initial outing, but nothing could save this drab affair. “MAN FROM RAINBOW VALLEY” (‘46 Republic) Monte Hale is the writer/artist of a popular comic strip based on Outlaw, King of the Wild Stallions, a real wild horse Monte and his kid sister allow to run free on his ranch. Desperate for something new for his dude ranch, Ferris Taylor has his niece, Adrian Booth, and two unscrupulous cowhands capture Outlaw. When Monte befriends Booth, unaware of her plans, Booth’s attitude begins to change. When Monte learns of the theft and deception, he coerces rodeo owner Taylor to put Outlaw up against $2,000 on a bet he can ride the stallion. Originally in Magnacolor, only b/w prints survive. Betty Burbridge’s script seems better suited to Gene Autry—possibly one Gene didn’t make before he left for Columbia. “OUT CALIFORNIA WAY” (‘46 Republic) After two lackluster attempts to establish Monte Hale as Republic’s new singing cowboy, Republic upped the running time of this third entry to 67 minutes, brought in vet director Les Selander, gave Monte the backing of Foy Willing and the Riders of the Purple Sage and, for insurance, used the guest star gimmick with Roy Rogers and Dale Evans, Allan Lane and Don Barry. The color process officially changed its name from Magnacolor to Trucolor though the color quality remained the same. With a movie studio setting and not very villainous villainy in egotistical “western star” John Dehner, the basic story has Monte trying to break into films while helping young Bobby Blake’s horse Pardner do the same. 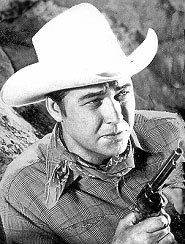 Republic execs quickly realized they needed to tailor Monte’s films more to his personality and not try to squeeze him into a Gene Autry format as they seemed to be doing in Monte’s first three westerns. “LAST FRONTIER UPRISING” (‘47 Republic) Easy going Monte is up against horse thieves who eventually kill his boyhood friend and frame the murder on Monte. Monte’s earliest B’s are still plotted and paced in the “Roy Rogers/Dale Evans” mold rather than Monte’s later more action oriented films. Although made in Trucolor, no color prints apparently survive. “ALONG THE OREGON TRAIL” (‘47 Republic) A much more action oriented direction than Monte’s previous films. Under new producer Melville Tucker (who would stay til the end of the series), the fights are tougher (one with Wade Crosby in a storeroom is a doozy) and the songs are lesser. Monte is under orders to hook up with scout Jim Bridger in Oregon and blaze a trail to the new territory. Outlaw Roy Barcroft, a sworn enemy of Monte, plots with crooked empire-builder Clayton Moore in a scheme to set up his own government in Oregon. Coincidentally, Moore and Hale are old friends that must now oppose one another. 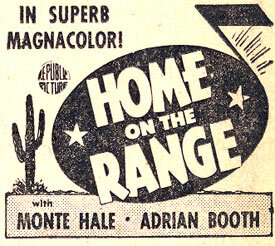 Max Terhune and his dummy Elmer provide some comedy relief for Hale in this one film. Foy Willing and the Riders of the Purple Sage sing three songs, Monte contributes two. Filmed in Trucolor, but only b/w prints seem to have survived. 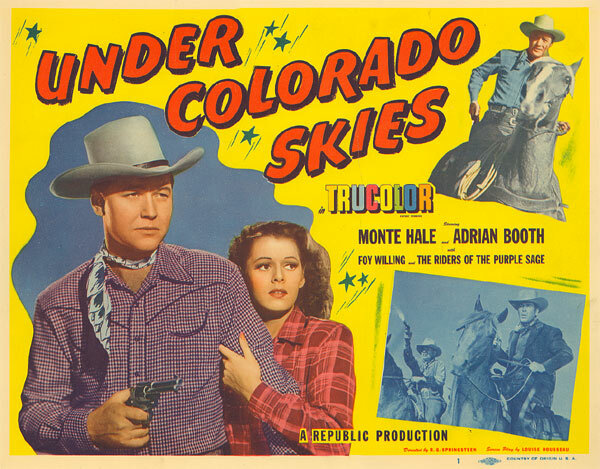 “UNDER COLORADO SKIES” (‘47 Republic) A strong contender for Monte’s best western, possibly edged out slightly by his next. After being falsely accused of a bank robbery and murder of the bank president that was actually carried out by three members of the notorious William Haade gang, bank teller and medical student Monte Hale is taken into custody. Escaping, Monte infiltrates Haade’s gang, secretly planning to orchestrate their capture. Fly in the ointment is bandit John Alvin, the brother of Monte’s sweetheart, Adrian Booth, so Monte must somehow cover up to protect her from finding out; all the while trying to convince Alvin to go straight. When Haade discovers Monte’s plot, it’s all-out breakneck action. As for music, Monte (on “San Antonio Rose”) with Foy Willing and the Riders of the Purple Sage never sounded more harmonious. Trucolor. “CALIFORNIA FIREBRAND” (‘48 Republic) A top candidate for Monte’s best western! In Trucolor, perfectly paced by director Phil Ford with strong action, good music (four songs by Monte plus the Riders of the Purple Sage) and light comedy (Paul Hurst’s evasion of his wife) makes this a winner in every department. Disguised as notorious outlaw Gunsmoke Lowry, Monte investigates a series of mining claim thefts. Monte’s helping Adrian Booth and her granny when the real Gunsmoke Lowry shows up. Remake of Roy Rogers’ “Sheriff of Tombstone” (‘41). “TIMBER TRAIL” (‘48 Republic) Another good Bob Williams script for Monte wherein Roy Barcroft stirs up trouble between brothers who operate stagecoaches and telegraph lines. 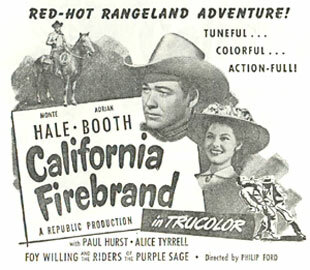 James Burke nicely replaced Hale’s regular comedy sidekick Paul Hurst in this one, which was the last Hale in Trucolor and the last to employ singing group Foy Willing and the Riders of the Purple Sage. “SON OF GOD’S COUNTRY” (‘48 Republic) After the Civil War, badmen want to run ranchers off their land because they have advance notice of the coming of the railroad. Town store-keep Paul Hurst sends for Marshal Monte Hale. The outlaws brand newspaper publisher Jason Robards Sr. and his son Jay Kirby as Copperheads but Monte works with Robards’ daughter, Pamela Blake, and Hurst to root out the real culprits. This was Monte’s first in b/w after eight in Trucolor. “PRINCE OF THE PLAINS” (‘49 Republic) The story presented here of Bat Masterson’s father being killed in a stage robbery has no basis in fact. With banker Owens murdered, bank stockholder Rory Mallison plans to take over as soon as he also kills off the soon-to-arrive son of Owens, Harry Lauter. Monte foils the attempted murder, but believing Lauter dead, Monte (with the help of Sheriff Paul Hurst) masquerades as Lauter to save the institution from bankruptcy. Monte only sings about two bars of “Owensville Jail”. Strong, involving story but a bit slow on the action content. Stock footage of a cliff top fight from Bill Elliott’s “Overland Mail Robbery” is reused at the climax. “LAW OF THE GOLDEN WEST” (‘49 Republic) In this remake of “Dark Command”, Republic casts Monte as Buffalo Bill with John Holland in the “Quantrell” role, posing as a leader of the Confederate Underground, but actually heading up a band of men involved in plain robbery and murder. Giving this modest B-western a bigger look is the liberal use of stock from its parent, “Dark Command”. “OUTCASTS OF THE TRAIL” (‘49 Republic) Badman Roy Barcroft and his timid scared-of-insects cohort, Milton Parsons, hold the whip hand of terror over Jeff Donnell and her young brother Tommy Ivo. Their father is ex-outlaw John Gallaudet who plans to return $100,000 he stole but Barcroft has other ideas. Monte Hale (as Pat Garrett) and his friend, barber Paul Hurst, set things right. If Monte resembles Allan Lane in some long shots, it’s because of the stock footage from Lane’s “Santa Fe Uprising” that was used. “SOUTH OF RIO” (‘49 Republic) Ranger Monte Hale busts up a crooked protective association run by Roy Barcroft and finds his brother (Douglas Kennedy) mixed up in the middle of it. These later action-packed Hales (produced by Mel Tucker) are far superior to his earlier music-oriented outings. “SAN ANTONE AMBUSH” (‘49 Republic) Cavalry scout Monte Hale is tricked and set up to take the fall for an Army payroll robbery engineered by Roy Barcroft. Thrown in jail, Monte is helped to escape by Sgt. Paul Hurst who believes in him. They soon encounter a town in the iron grip of crooked Trevor Bardette, the federal commissioner for West Texas, who is systematically raising taxes to drive local ranchers off their land. The thieves are opposed by Robin Hood-like bandits robbing tax money from Bardette and turning the cash back over to area ranchers. Monte and Hurst join forces with the do-gooders to thrash out Bardette’s corrupt ways. “RANGER OF CHEROKEE STRIP” (‘49 Republic) Unscrupulous cattleman Frank Fenton wants to lease the Indian land for five years. When Chief Monte Blue won’t agree, Fenton’s man knifes him, lays the blame on Douglas Kennedy and has forger George Meeker sign the lease agreement. Ranger Monte Hale and Sheriff Paul Hurst eventually clear Kennedy’s name. “PIONEER MARSHAL” (‘49 Republic) Undercover marshal Monte is in trouble up to his six guns in an outlaw sanctuary run by psychological killer Damian O’Flynn. Although this is soundly into Monte’s “straight action” period, he briefly warbles a song about Dallas to leading lady Nan Leslie. 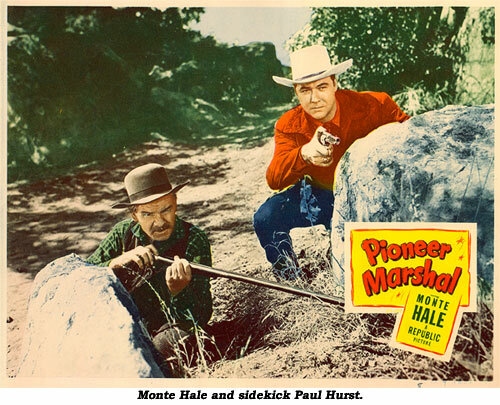 “VANISHING WESTERNER” (‘50 Republic) Special gubernatorial appointee Hale is sent to investigate) the rampant lawlessness reaching its peak in Broken Bow. Undercover, Monte is hired by the gang, led by Roy Barcroft. Several unique plot twists that we won’t give away and spoil the outcome in this remake of Kirby Grant’s “Lawless Breed” (‘46), both written by the skillful Bob Williams. Although an unusual, absorbing plot, it’s somehow not right for Monte. Also the overuse of “green sets” in place of outdoor locations, especially during the final shootout in a fake graveyard, is a big detriment. “OLD FRONTIER” (‘50 Republic) Newly appointed town marshal Hale and his helper Paul “Skipper” Hurst (whose jargon is all nautical related) go after bank robbers Lane Bradford and Denver Pyle. After Pyle is wounded and captured, outlaw boss Tris Coffin dispatches his right-hand man, William Haade (in another of scripter Bob Williams well conceived comic-badmen as a hypochondriac named Pills), to kill Pyle and lay the blame on doctor Bill Henry, as well as the murder of Judge Victor Killian, but Monte clears him and brings the crooks to blazing gun justice. Monte sings a few bars of “A-Roving”. 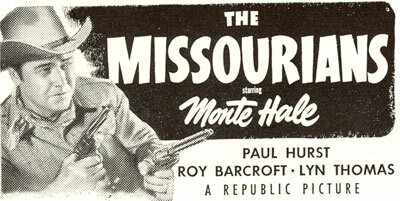 “THE MISSOURIANS” (‘50 Republic) It’s a shame Republic ended the Hale westerns in 1950 as Monte’s last 8-10 films under producer Mel Tucker’s guidance were far superior to his earlier efforts, even those shot in Trucolor. “The Missourians” develops solid storytelling points for young viewers of the time against prejudice and for equality. The vicious Missourians gang led by Roy Barcroft (in one of his best roles) is on the dodge from the law. They decide to hide out in Laredo, TX, where Barcroft’s estranged mother and kid brother are trying to lead respectable lives even though the townspeople are prejudiced against them because of their nationality and their outlaw kin. It takes everything Marshal Monte and his friend lawyer Paul Hurst can do to capture Barcroft’s band..